Shows in video format on Comic Frontline, Zone 4 or Dark Avenger C86 YouTube channels. 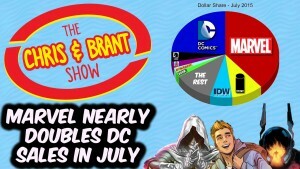 The Chris & Brant Show: July 2015 Sales Marvel Nearly Doubles DC Sales! Chris and Brant discuss the July 2015 comic sales where Marvel nearly doubled DC Comics sales. Finally, we have a name for the random shows we do on this channel. Now with a title comes a new ongoing series!